Picture credit: Ho Ah Choon, Sarawak in Pictures - 1940's -70's, Sarawak Press Bhd, Kuching. The airport buildings were made of timber and even the row of private individual houses fronting the airport (at the background of the picture) were also made of timber structures and roofing of "belian" shingles. The picture shows passengers alighting from the aircraft and going to the arrival/departure building at right of the picture. The site of the old Bintulu airport building taken on 13.12.13. Note the low rise nature and construction of shophouses in concrete and roofing of metallic sheets. 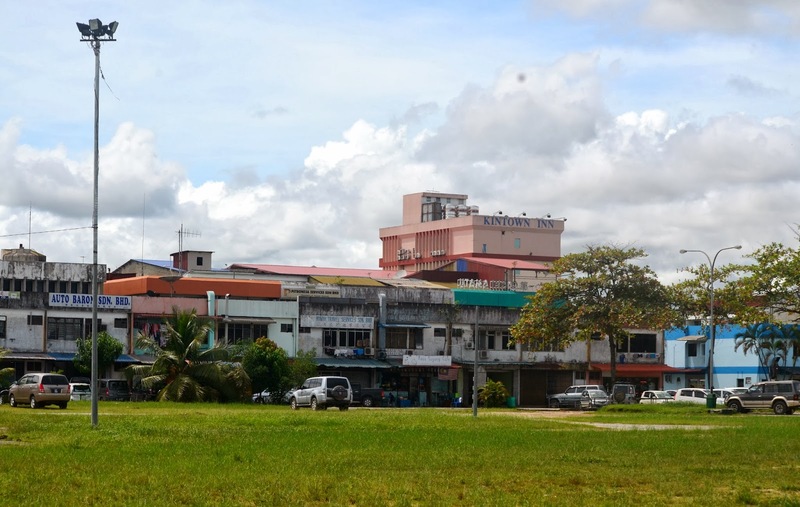 Bintulu is one the most interesting places to visit in the early days of its development because of the ease of arriving and departing Bintulu town. The airport was located right in the midst of town. According to records, the Bintulu airport was built in 1938 but construction was halted when the Japanese invaded Bintulu in 1941. After the war was over, construction was renewed and completed in August 1955. The first civil aircraft to land at the Bintulu airport on the morning of 26th August 1955 was "Rapide" - a twin rotor aircraft with wings made of canvas. Later a Twin Pioneer - 16 seater plane was in operation to replace the "Rapide". Other types of planes used in succeeding years were the Fokker Friendship and Fokker 50. With the construction of a new airport and its use, the old airport was abandoned and the site cleared and used for miscellaneous functions like fun fair, kite flying, and free car parking spaces. The old airport was officially closed on 29 March, 2003 and flights in and out of Bintulu were handled by a new airport built 23 kilometers away from the town centre, towards the south of Bintulu town.